The Denver Broncos used the exclusive franchise tag on outside linebacker Von Miller Tuesday morning. #Broncos retain exclusive negotiation rights with @millerlite40 . Under the franchise tag, Miller would be guaranteed a $14.04 million salary in 2016. But the Broncos have until July 15 to work out a long-term deal. 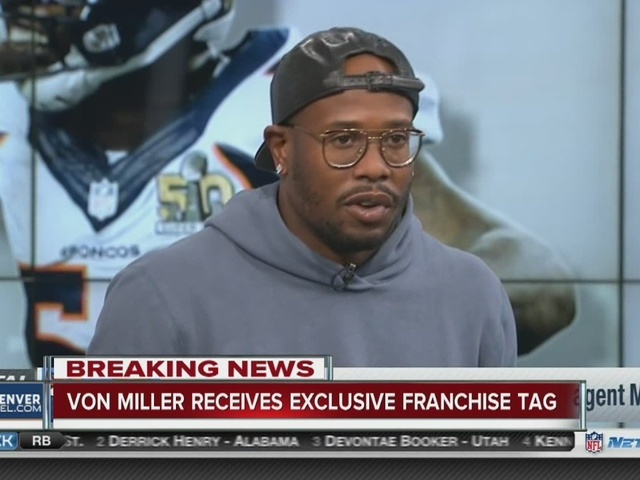 Denver Broncos GM John Elway has been exchanging long-term contract proposals with Miller's agent, but it appears they won't come to an agreement before Tuesday at 2 p.m.
#Broncos place exclusive franchise tag on @Millerlite40 . "Designating Von as our franchise player gives us the time to continue working toward a long-term agreement," said Elway. "We've had productive talks with Von's representation, and we'll continue those discussions with the goal of making sure Von remains a Bronco well into the future." The Super Bowl 50 MVP appeared on NFL Network Monday, and was asked about getting the franchise tag from the Broncos. "I have never been franchised before so I can't really say, 'Hey I don't want to be franchised. I don't want to do this.' I can tell you what. I want to be with the Denver Broncos," Miller said. "I want to be with Derek Wolfe, Chris Harris, all those guys, DT. I want to be with those guys my whole career, and whatever it takes to get it done I am down for."